Our hearts are filled with thanks for your valuable help, keeping our mission healthy and strong throughout this past year. Thank you so very much. May you enjoy a blessed New Year, as together, we face the challenges ahead. May God be ever with you. 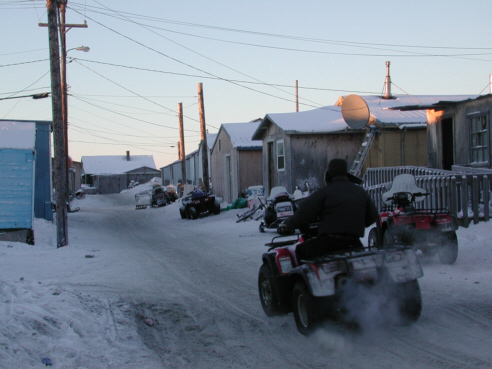 CLIFFORD WEYIOUANNA (way-yoo-WAH-nah) (left) warms up his snowmobile to drive Tom Busch and Les Brown across the village of Shishmaref (SHISH-mah-ref). Weyiouanna is president of the Bering Straits School District, and a respected hunter and guide. He’s long been a great help to KNOM’ers visiting the village. With his and other villagers’ help on November 26th, Tom and Les identified a suitable site to install a KNOM repeater. 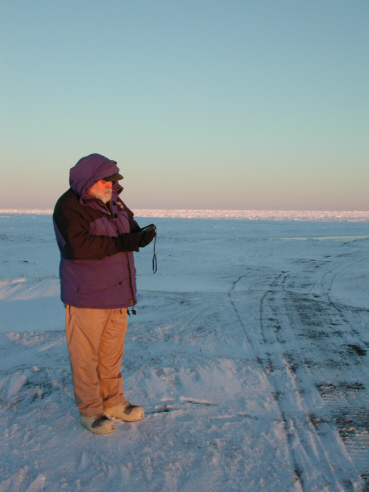 (Left) Les takes a Global Positioning System reading on the Shishmaref beach. 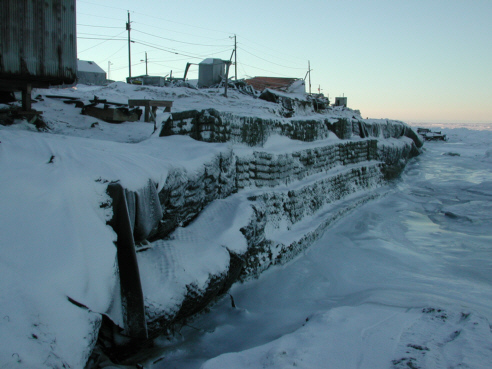 A few feet behind Les, the narrow beach leads to the frozen Chukchi (CHUK-chee) Sea, an arm of the Arctic Ocean. Shishmaref is located on a narrow barrier island, basically a strip of sand, 25 feet above sea level at its highest. The village has been inhabited for hundreds of years. 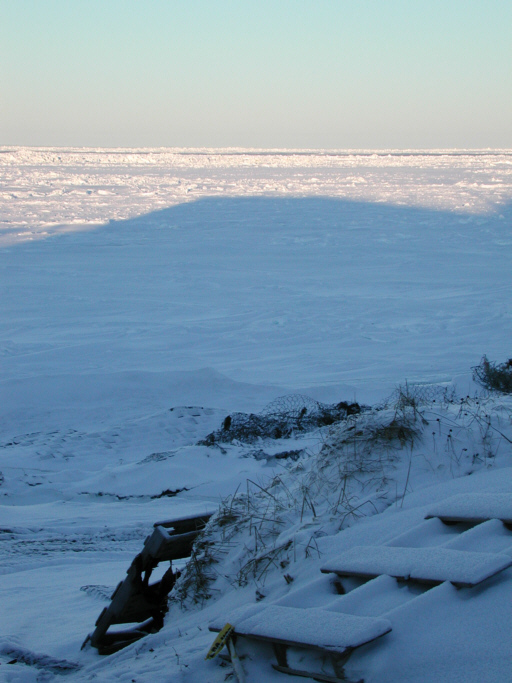 It's an excellent location for subsistence hunting and fishing, and its 562 people are strongly tied to the spot. 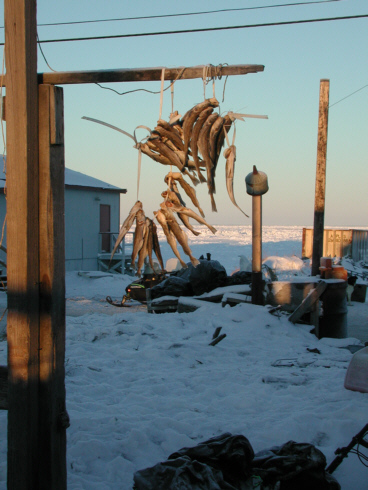 Most of the food in town is from the land and the sea: walrus, polar bear, fish, seal, rabbit and caribou. However, the village is slowly washing away. (above left) In the full size image, a dark line is visible near the horizon. This is where the water line stood twenty years ago. Only a few years ago, this hundred-yard stretch was covered with high dunes. (left) Today, houses built on the dunes are waging a losing battle against the sea. The village has been breached by waves several times in the past, and its 562 inhabitants are hoping to keep the community going for ten to fifteen more years, while a new location can be identified and the village can be moved. (left) You'll find a few pickup trucks in Shishmaref, but four-wheelers and snowmobiles are more affordable and less expensive to operate. This is the road known as "Main Street" in the village. (left) Let nature do the work: Tom cod, caught through the ice, hang outside a home to freeze-dry in the elements. The cost for bringing KNOM to this isolated point is between $4,500 and $5,000. Can you help? CRYSTAL CLEAR: At press time, we learned that KNOM production director Mike Nurse’s “Eskimo Stories and Legends” has just been honored with a Communicator Crystal Award for Excellence. INSPIRATIONAL SPOT: A Christian must keep the faith, but not to himself. 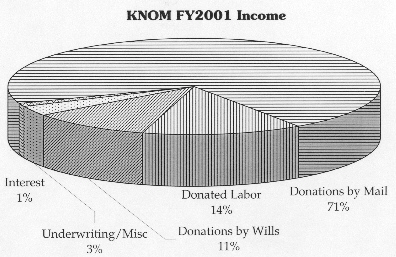 top FINANCIAL REPORT: As you can see when you click for the full size chart, 96% of KNOM’s income is donations by individuals. 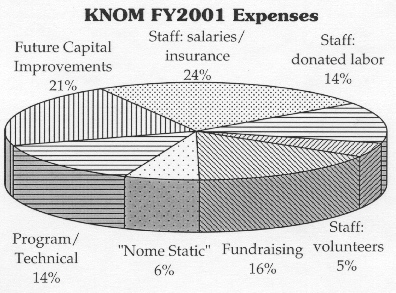 This includes an estimated $158,000 contribution by the KNOM staff, who work for less than market wages. This donated labor is included in both our income and expense charts. Our total cash expenses for the fiscal year were $744,993. An additional $245,790, about half of which was received as bequests from wills, was assigned to future capital needs and to our emergency fund. Increasing our emergency fund was a recommendation by our late Bishop Michael J. Kaniecki, SJ. At present, it would fund our mission for about nine months. 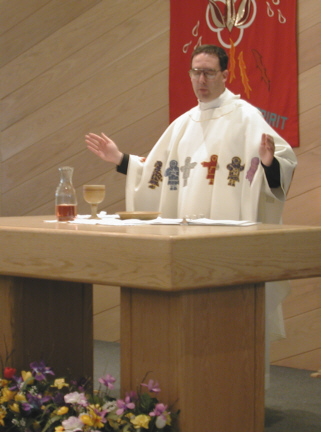 KNOM is owned by the Diocese of Fairbanks, which has the corporate name Catholic Bishop of Northern Alaska. 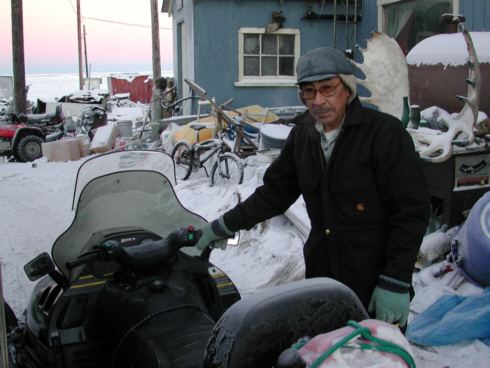 Over 99% of our donations income is contributions sent directly to us in Nome. If you would like a detailed copy of our finances, just drop a line to general manager Tom Busch and he will be happy to send it along. Facts and figures: KNOM is the oldest Catholic radio station in the United States, beaming God’s Love throughout 100,000 square miles of remote western Alaska, and deep into Russia, too. We are on the air to improve the lives of the thousands of isolated families who live in villages throughout this wild, roadless area. We broadcast daily Rosary, Sunday Mass, approximately 34,000 inspirational spots, and 34,000 educational ones, plus hours of news, interviews, discussion of important issues and positive entertainment. As you can see from our income chart, above, our work is entirely thanks to you. INSPIRATIONAL SPOT: A day hemmed in by prayer is less likely to unravel. January: News director Paul Korchin begins an educational leave of absence to Harvard University to complete his PhD in ancient mideastern languages. For the first time in seven years, the news department is headed by a first-year volunteer, Olin Fulmer. On the 9th, KNOM entered its sixth year of 24-hour-a-day operation. KNOM volunteer Victoria Pasquantonio visits Anadyr, Russia for the inauguration of the region’s governor, returning with dozens of interviews. 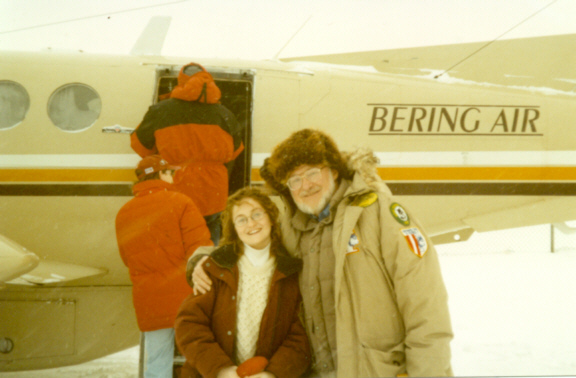 (Left) Victoria shares a hug with Nome mayor Leo Rasmussen before boarding the Piper Navajo for the 500-mile flight. With 12,000 souls, Anadyr, Russia is the closest town to Nome of that size. 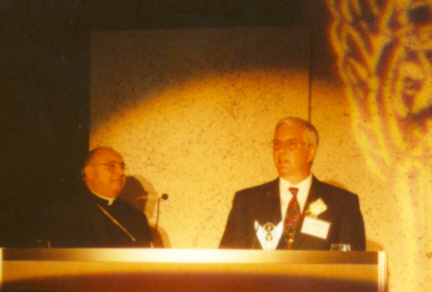 February: Former volunteer Eric Gabster (left) accepts KNOM’s Angel Award at the Roosevelt Hotel in Hollywood. The award honors Mike Nurse’s “Eskimo Stories and Legends” program. Volunteers Andrew McDonnell and Victoria Pasquantonio fly 120 miles southwest of Nome to the Yup’ik village of Stebbins to cover the villages’s huge regional Eskimo dance festival. Stebbins has only 543 residents, who during the event host over 200 guests. March: KNOM devotes five days to an intensive series of interview programs, news reports and call-ins on “Kids Behind Bars,” children who get into trouble, later winning the Alaska Broadcasters Association’s “Best Service to the Community” for the work. 100 MPH winds rake western Alaska. A groundstorm strands 22 people in a remote 10-ft. x 12-ft. cabin east of Nome for four days. April: KNOM extensively covers Nome’s 100th birthday celebration. On the 9th, we air “Happy Birthday to You” performed by 1,000 enthusiastic kazoo players. 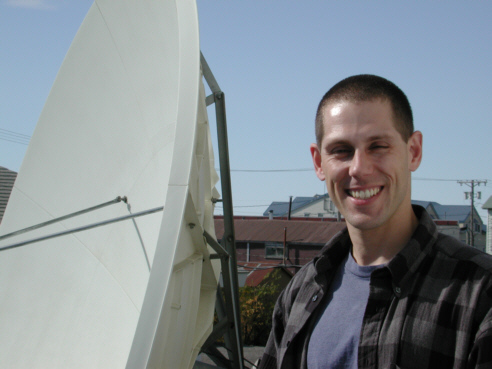 May: KNOM program director Ric Schmidt estimates that in addition to news, weather and interview programs, KNOM broadcasts 1,500,000 public service words a year. June: KNOM news director Paul Korchin (left) returns to work with a fresh PhD from Harvard University, to find a sign on the newsroom door, “Linguistic Help 5¢. The Doctor is In/Out,” mimicking the Peanuts comic strip. A survey conducted by Eastlan and Associates of Seattle gives KNOM high marks. While Nome has two radio signals besides KNOM, plus cable radio, KNOM enjoys 77.1% of the town’s listenership. The survey samples 5 villages, all of which can hear one or two other signals. In these villages, KNOM ranges from 79.3% to 100%, averaging 87.6%. 54% of the people who listen to KNOM never listen to anything else. July: On KNOM’s 30th birthday on the 14th, 1989-92 volunteer Ross Tozzi (left) is ordained a priest in Nome’s St. Joseph’s Church. KNOM’s anniversary Mass is celebrated by retired Anchorage Archbishop Francis Hurley, who ordains Ross the following day. In this picture, Ross is celebrating his first Mass of Thanksgiving. The joyous celebration increases Nome’s population by 1.6%. August: KNOM-AM is off the air for 38 hours while its antenna is extensively rebuilt (left). 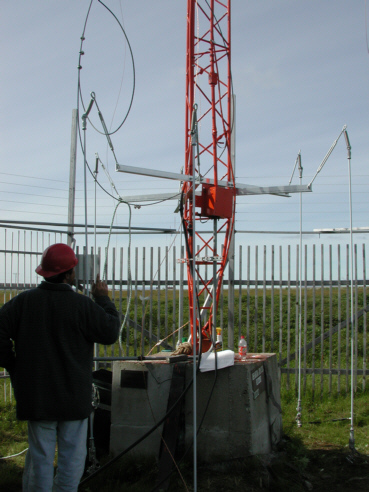 The new folded unipole antenna, with 6 wires running alongside the tower, provides an improved signal. Following the September 11th attacks, KNOM broadcasts 61 continuous hours of live coverage. October: It’s a busy month. In San Antonio, Texas, (left) Tom Busch accepts KNOM’s ninth Gabriel Radio Station of the Year Award. Also visible in the photo is San Antonio’s Archbishop Patrick Flores, who presented KNOM the honor. Television Station of the Year is Boston giant WCVB-TV. The same month, Tom and engineer Les Brown fly to the remote village of Kaltag, some 200 miles east of Nome, to take measurements and decide the exact location of a KNOM repeater there. Tom is also in Washington, DC briefly to discuss with the FCC’s top broadcast engineers the Kaltag repeater, a repeater for the village of Shishmaref (SHISH-mah-reff), and KNOM’s proposal for higher night-time power. For the Kaltag repeater and the higher power, it looks like an uphill battle. We sincerely thank consulting engineer Jack Mullaney for generously donating his time and expertise. November: The temperature remains well below freezing, frequently below +10°, for a period of 32 days. In mid-November, the mercury suddenly rises to a near-record +41°. The ground, however, is so cold that the snow cover remains frozen. The week after Thanksgiving, Tom and Les fly to Shishmaref to establish a location for the repeater and take measurements. December: KNOM’s “Eskimo Stories and Legends” is presented a Communicator Crystal Award for Excellence. It’s the third major national honor for KNOM in the year 2001. Once more, we thank you for your prayers and your financial support. It has been a productive year for our mission, and it is greatly because of you. Thank you for being our strength. We thank God for your help, and we keep you in our prayers. May He guide and greatly bless you and those you love this coming year, and always.